SYNOPSIS: England, 1554. In the wake of the failed Wyatt Rebellion, a vengeful Queen Mary has ordered all conspirators captured and executed. Among the imprisoned is her own sister, twenty-one-year-old Princess Elizabeth. Though she protests her innocence, Elizabeth's brave stand only angers Mary more. Elizabeth longs to gain her liberty-and her sister-s crown. In Honor and Richard Thornleigh and their son, Adam, the young princess has loyal allies. Disgusted by Queen Mary-s proclaimed intent to burn heretics, Honor visits Elizabeth in the Tower and they quickly become friends. And when Adam foils a would-be assassin, Elizabeth-s gratitude swells into a powerful-and mutual-attraction. But while Honor is willing to risk her own safety for her future queen, aiding in a new rebellion against the wrathful Mary will soon lead her to an impossible choice. Riveting, masterfully written, and rich in intricate details, The Queen's Captive brings one of history's most fascinating and treacherous periods to vibrant, passionate life. 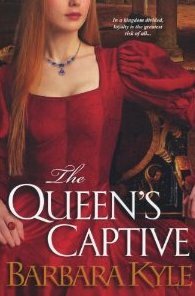 REVIEW: The Queen’s Captive is the third book in the Thornleigh series, following The Queen’s Lady and The King’s Daughter. The main protagonist Honor Thornleigh is living in exile with her husband Richard in Antwerp when Sir William Cecil appears and asks that she assist and advise Elizabeth Tudor, who is imprisoned at Woodstock by her sister, Queen Mary. Elizabeth is under suspicion of supporting the Wyatt rebellion and Cecil is afraid that the young princess will break under the constant harassment and questioning by her sisters’ councilors, which will give Mary the excuse she needs to execute her or that she will be quietly killed by an assassin. Hesitant to be thrust back into the fire, but with their funds almost down to nil and with the promise of receiving a full pardon and the chance at moving back home to England, Honor accepts the mission. Having not read the previous two books in the series I thought I would be a little lost, but Kyle does a good job at providing just enough background information to get the reader by but without rewriting the last book. Now it’s rare that I deviate from just straight historical fiction and have only read one or two historical mysteries, so it took a bit of sitting back and allowing my imagination to run and just let myself be entertained. And entertained I was, with great characters and an interesting plot Kyle is an author I will be reading again! For more information, please visit Barbara Kyle's WEBSITE. FTC DISCLOSURE: I received this book in return for a fair and honest review. I haven't read any of her books, but I have this one and The King's Daughter in my TBR pile. Thank you for the review. Sounds like this will be an enjoyable and entertaining read. Sounds like an interesting read! I hate that they cut off half the head.. from the cover. This was a great review, but I just can't make myself get excited about this. Maybe I just need a good long break from those wacky Tudors.